Think about when you do a search for something in Google. Why do you click on the link you click on? It’s because you believe that link will answer your search query – but why? Whether you do it consciously or not you’re looking for the most credible website to visit. That’s exactly what your target audience is looking for. 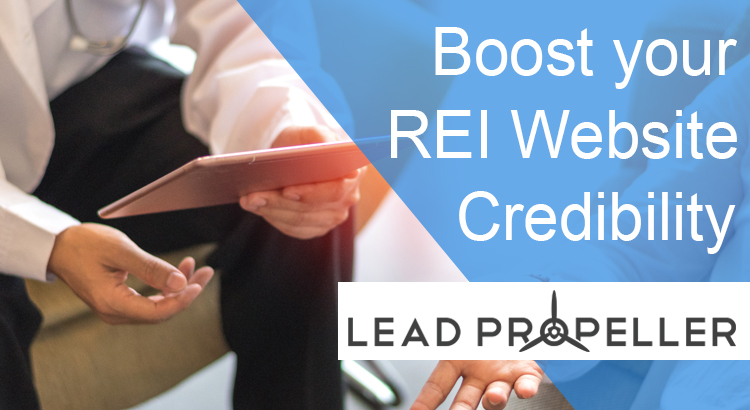 Let’s learn how you can easily boost your real estate investing website credibility so that your visitors convert into leads. Credibility for real estate investing websites comes down to how trustworthy you come off to your target audience. Targeting motivated sellers? Present yourself as someone who wants to help, not as someone who just wants their house. Targeting other investors to build a buyers list? Show them that you’re a reliable investor to work with. Presumed Credibility – This kind of credibility comes from general assumptions that are related to your service or product. In the case of your real estate investing business, there’s a lot of assumptions that investors are scammers. Those assumptions can hurt your traffic because sellers don’t want to get caught up in a house scam. You need to make sure you boost your real estate investing website credibility so that you don’t look like a scammer (we’ll give you some great strategies further down in this article). Reputed Credibility – This refers to reviews and testimonials that should already be on your real estate investing website. When a visitor comes to your site and they see someone else who’s not affiliated with your business saying positive things, it builds your reputation and credibility. Surface Credibility – Surface credibility is what a visitor forms when they go to your real estate investing website. This gets established by their experience on your page. If your page loads slowly, looks outdated, or doesn’t have clear information then visitors might not find you credible. Earned Credibility – This type of credibility is built on your real estate investing business’s interaction with leads, potential clients, other investors, and so on. We’ll go over ways you can earn your credibility further down in this article. The take away is that type of credibility is based on you and your personal interactions with people in and out of your business. There are lots of methods you can use to boost your real estate investing website credibility. 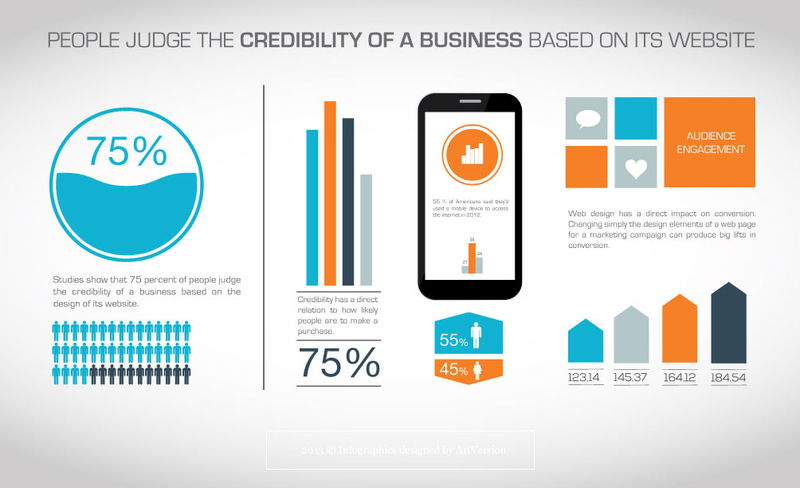 The truth is that your business’s credibility is being judged by your website. That’s why you need your online presence to reflect your business, yourself, and how trustworthy you are as an investor to work with. Let’s go over a credibility building checklist for your real estate investing website! 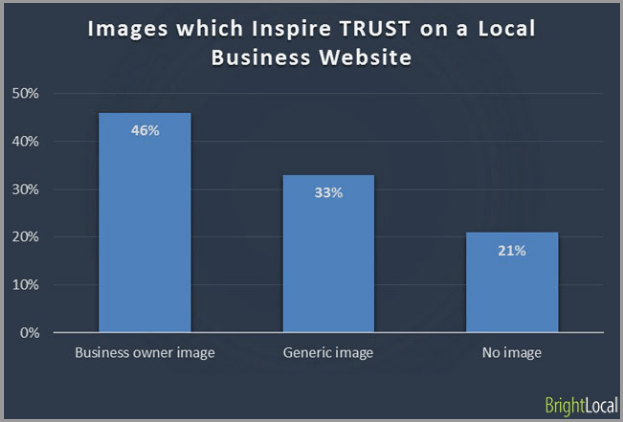 Not only is using pictures great for SEO, but your strategic use of pictures on your website makes you personable. Being personable is the key to establishing credibility with visitors. If your real estate investing website is filled with stock photos, you’re going to come off as a fake business. You don’t want that. Pictures of yourself. We’ve found that personal photos work better than corporate photos. Don’t spend time on an expensive photoshoot, just use a picture of you and your family. The more authentic the picture is, the more trustworthy you come off to sellers. Pictures of your properties. Duh. Not including pictures of your properties is like going to a clothing website with no pictures of clothes. Let visitors know that you’re serious in real estate investing by showing pictures of your properties. Use before and after pictures, pictures of your houses when they’re on the market, and so on. Pictures of your team. If you have a team, be sure to include them on your website. You wouldn’t want a motivated seller calling the number provided, expecting to talk to you, and then getting someone else on the line. That makes it seem like you’re not a real person, just a corporate guy in a suit running a house buying business. Don’t give off the wrong message. Include your team! We talked about the essential use of testimonials in a previous article, so we’ll do a crash course here. 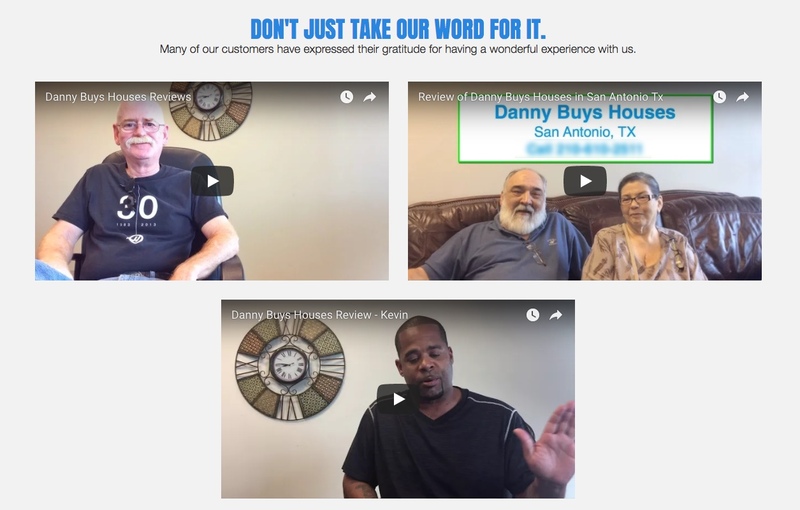 The best types of testimonials to use are video testimonials because they show website visitors actual people giving their opinions on your business. It’s much more easy to believe and understand someone giving their opinion from a video than from a block of text. Whenever possible, get a quick video testimonial from your happy clients. If you don’t have reviews on those sites yet, don’t worry. You can build those up over time. There are other local citations that you should look into that also have review boards. The more positive reviews you get online, then more credible your website will be. Noting is more frustrating for a motivated seller who’s looking to get rid of their house immediately than going to a website and not knowing how to get in contact with you. Your business phone number should be at the header of every page as well as sprinkled into paragraphs. Additionally, you need to have a clear and understandable Contact Us page. This page needs to appear in your website’s navigation bar. When a visitor clicks on the contact tab they should be brought to a page that has your phone number and email clearly visible. Bonus points to you if there’s a “Send a Message” interface! Not only will they be able to send a message from your website directly to your preferred email, but you’ll also get their contact information to follow up with them. It’s a win-win. 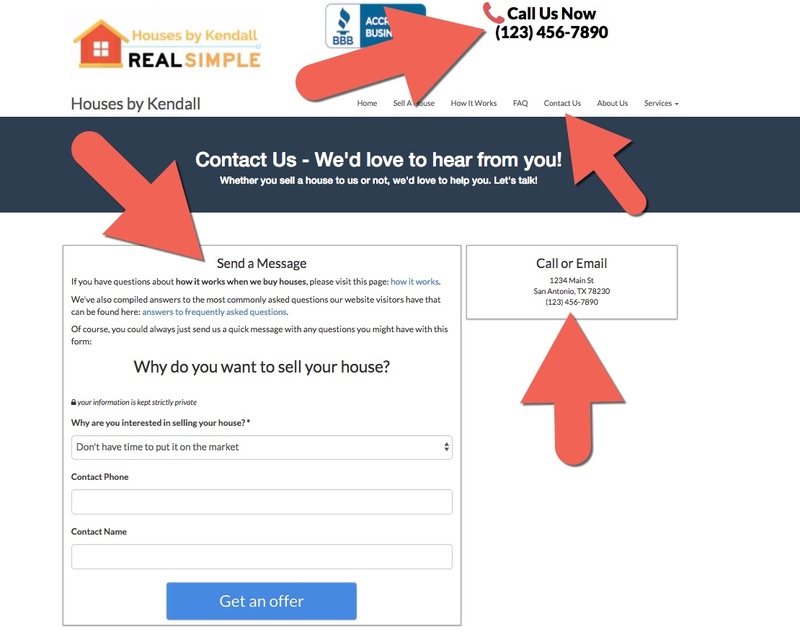 If you’re contact information isn’t clear then there’s no way you’re going to boost your real estate investing website credibility. Be easy to contact! When a motivated seller is visiting your website they’re looking for information on your business. If they are able to find information on the process, or answer any questions they have with what you have on your site, they’re more likely to contact you. FAQ sections are great for this. How fast will you be able to close on the house? Will you buy the house with no repairs? I have legal issues attached to the house, is that a problem? There are tax liens on the property, can you help? What if the property has tenants living in it? Just like we said earlier, visitors are judging your real estate investing business based on your website. If you don’t have a clear and easy to use web design then you’re losing leads! You’ll see a lot of web design gurus out there who will teach you basic HTML and coding, and that’s great, but let’s be serious – you don’t have time to learn another skill like that. Especially one that is very time consuming. Of course, you could always go with a website template like the ones you can find on Wix or Square Space, but then you have to put in the days of building and optimizing it, then go back and add all of the stuff we just talked about on top of all the SEO building you need to do. That’s…very tedious. We know, we build websites. You’re a real estate investor, not a web designer. We understand that. That’s why our LeadPropeller websites are already built for you. Our websites have high credibility boosting content, 77% more built in SEO, and completely fleshed out pages already there for you. All you have to do is fill in the “Business Information” page on your dashboard and our websites will do the rest. 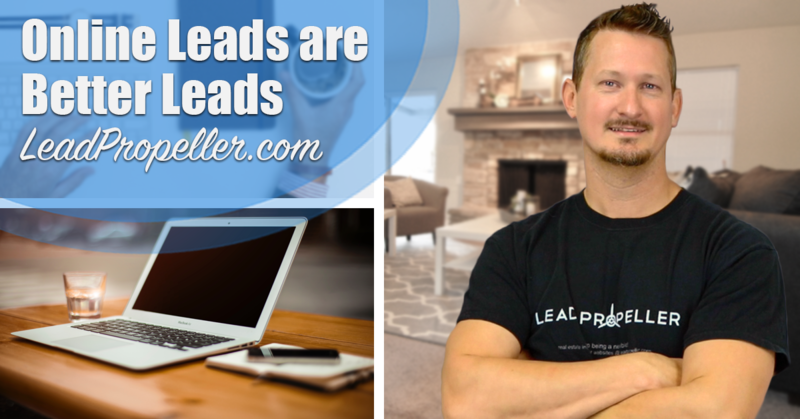 Hands down, the best part of having a LeadPropeller website for your real estate investing business is that it’s ready to go live in just 15 minutes. No, we’re not kidding. Once you fill in the business information on your dashboard, your website will automatically be customized to your local area, target audience, and business. All you have to do is hit “publish”. credibility with our free training!